Quinton Berkompas, armed with a clipboard and a plan, sees the 20,000 students who arrived in Pullman this fall as more than just classmates. “We finally have an election to rally around,” said Berkompas, president of Washington State University’s Young Democrats, taking a break last week from registering students to vote in Eastern Washington. His goal is to continue to push the needle in favor of Democrat Lisa Brown, who emerged ahead of Rep. Cathy McMorris Rodgers in Whitman County in an August primary field that included three other Republicans. Yet it’s unclear, from a computer analysis of primary voting data going back to the 2014 midterms, whether such a push for young voters will be able to counter an electorate of largely rural, Republican-leaning areas. Conservative-minded students are pushing a get-out-the-vote effort themselves in a county where the largest city is home to Eastern Washington’s flagship education institution, surrounded on the outskirts by wheat-farming country that is firmly for the GOP. Hours after Berkompas and his cohorts finished their recruitment drive for the day in Pullman, John Brabb, the chairman of the Whitman County Republicans, was tacking up signs endorsing McMorris Rodgers at the Palouse Empire Fairgrounds outside of Colfax. He ran out of yard signs for the congresswoman ahead of the event, just as he did for President Donald Trump during the 2016 campaign. Whitman County, like Spokane County, has a blue dot in a sea of red on the electoral map. And also like Spokane County, that blue dot was strong enough in August to push Brown to the head of the pack. 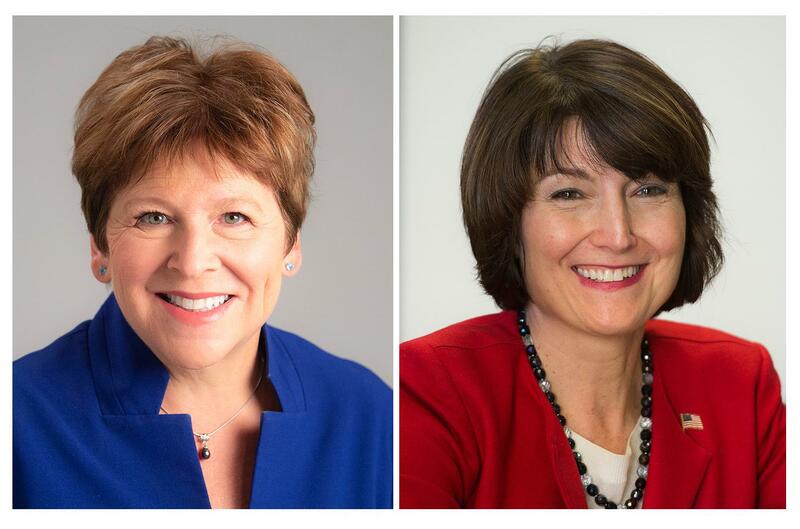 District-wide, McMorris Rodgers topped Brown by nearly 8,000 votes. One place Brown’s supporters hope to make up the gap in the November election is with the returning students on college campuses, particularly at WSU. Republicans are quick to point out Brown’s deficit may be even more. More than 9,000 ballots were cast for conservative candidates, Dave Saulibio and Jered Bonneau, both of whom have endorsed the congresswoman in the general election. Add those votes, and Republicans took at least 50 percent of the vote in all 10 counties in the district. And conservatives are sponsoring a student effort of their own. David McLerran, an active member in student political organizations on campus, has already recruited a dozen conservatives to the cause. “This campus, in particular, is fairly conservative. There’s a lot of conservative organizations,” McLerran said. The campaign also will have a ground game at Gonzaga University, Whitworth University and Eastern Washington University. Brown’s campaign will be making similar swings, all in pursuit of a bloc of voters who have historically low turnout rates but are an injection of new ballots into the tightest race the district has seen in decades. WSU’s Young Democrats are playing the numbers game. The group is registering students to vote without asking about political affiliation. Organizers, many of them interns for Matthew Sutherland, a WSU graduate student who is running for the state House, theorize that about three out of four students they speak to will side ideologically with the left. “We know if we get students registered, they’re going to support Lisa and Matthew,” Berkompas said. The organization began signing up students outside the Compton Union Building in the center of campus just as classes resumed for the fall. As of last week, they’d registered about 1,200 students, with a goal of reaching 5,000 by the deadline in early October. Even if three-quarters of those students who Democrats sign up do vote for Brown, it’s not clear that would be enough to keep the entire county blue. Brown outpaced McMorris Rodgers in Whitman County by 286 votes in the August primary, though about 450 votes went to other Republican candidates in the race. If Brown wants to better that performance in this corner of the district come November, she’ll have to build upon what was already a strong showing in the deep-blue heart of Pullman, where Democrats have traditionally earned large margins of victory. Precincts – small geographic clusters of voters within a county – closest to downtown were where Brown posted her largest vote totals over McMorris Rodgers in August. In many cases, the Democrat flipped precincts that had been won by McMorris Rodgers over Democrat Joe Pakootas in the 2014 primary, the most recent congressional race without a presidential campaign and all the additional voters drawn by a top-ticket contest. For example, in the August 2014 primary, Pakootas earned 83 fewer votes than McMorris Rodgers in a precinct of Pullman on the northeast edges of town. Last month, Brown earned 226 votes more than McMorris Rodgers in that same precinct, where turnout for both Republicans and Democrats far outpaced levels from four years ago. WSU College Republicans are not involving themselves directly in advocating for McMorris Rodgers, though the organization is developing its own voter registration drive. Amir Rezamand, a Moscow, Idaho, native who is president of the College Republicans, said his group was focused on issues, not candidates. “As a club, we don’t have any direct ties with the candidate,” said Rezamand. The congresswoman distanced herself from the club’s former president, James Allsup, following his appearance at an August 2017 rally for far-right political groups in Charlottesville, Virginia, where a counterprotester was killed. Allsup stepped down as president of the club after the rally and made a controversial appearance at a political meeting in Spokane Valley this summer that led to the resignation of the head of the Spokane County Republicans. Those pushing for McMorris Rodgers on WSU’s campus plan to use Brown’s record in the state Legislature as evidence the Republican congresswoman is a better candidate for students. Brown was named the state Senate’s majority leader in 2005, when tuition to attend WSU in Pullman was $5,506 for a Washington resident and $14,514 for a student from another state. By the time she left office in 2013, those totals more than doubled for a resident to $11,396 and rose for out-of-state attendees to $24,478. State institutions were given permission to raise their tuition rates more sharply as the Legislature dealt with the economic downturn that began in 2008. State funding for higher education was slashed as part of other cuts intended to balance the state’s budget, and the McMorris Rodgers team says the reductions in funding and tuition boosts are part of Brown’s record as a leader in the Senate. Brown, in an interview Tuesday, said it was shrinking federal support for higher education that prompted the entirety of the Legislature to make tough decisions about funding and authorizing tuition increases in the 2000s. “It’s a national problem that the federal government does not support higher education the way it did when I went to college,” Brown said. A report in July from The Institute for College Access & Success noted that the Pell Grant, the federal government’s subsidy program to assist higher education students, covered the smallest portion of college costs in its 40-year history in 2018. Brown pointed to several measures she supported to make college more affordable during her time in the state Legislature, including a scholarship program for seventh- and eighth-grade students to cover tuition and some book expenses at public universities. Meanwhile, Berkompas said the Democrats will try to tie McMorris Rodgers and downballot Republicans to the policies of Trump, which he said contrasted sharply with the social values on campus. But it is that relationship that will resonate with voters off Pullman’s campus, Brabb said. Cornell Clayton, head of Washington State University’s Thomas S. Foley Institute of Public Policy, said McMorris Rodgers is making the same error as other incumbent Republicans running in southeast Washington – not meeting students on their turf. The congresswoman has not yet agreed to a debate, or even a town hall event, in Pullman. Clayton also hasn’t heard from downballot Republicans about debating their Democratic challengers in front of students. “It is a problem that none of the incumbents are willing to come to the university’s campus, given how large of an institution it is,” Clayton said. “This isn’t exactly Berkeley,” he added, referring to the California campus that has been the site of several progressive demonstrations, some violent, in recent years. Berkompas, of the university’s Democrats group, said they took it as evidence their influence was growing. The McMorris Rodgers campaign said she will appear on campus for tours in the coming weeks, and campaign organizers in Pullman expect the congresswoman to speak to them in person before the November election. They also point out that McMorris Rodgers appeared at several summertime events, including the annual Albion Fourth of July parade in Whitman County, that Brown didn’t attend. It’s also unclear whether efforts to register students, who have historically low voting rates, is a sure-fire a strategy to receiving additional ballots in November. “This is a group that’s notoriously bad for participation,” Clayton said. Gains between the primary and general elections in and around Pullman over the past few congressional elections have shown that most gains for Democrats inside city limits are met with nearly equal or even greater gains by Republicans in outlying areas of Whitman County. In the past three election cycles dating back to 2012, McMorris Rodgers’ countywide vote total increase in the general election was greater than that of the Democrat in the race, despite margins of victory increasing within Pullman’s city limits for Democrats. Democratic congressional candidates lost Whitman County in 2008 and 2016 – even though Whitman County was the only Eastern Washington county to vote Democratic in the presidential elections those years. Students milling about the union as Berkompas and others held clipboards showed eagerness to register to vote, but little knowledge of the local candidates as of early September. Many referenced the massive campaign signs for each candidate hanging at the top of the hill as motorists enter town from the rolling hills of the Palouse. “I think if I knew more, I would think about registering,” said Sarah Hushagen, a junior majoring in business marketing from Centralia, Washington. She described herself as “more Democratic” after working for a debt collection agency, but hadn’t paid much attention to the Congressional race. Fellow juniors Molly McDowell and Brooke Eshleman said they’d just been encouraged to register not by the local Democratic group, but the university’s student government chapter. McDowell and Eshleman said they’d seen the candidates’ signs around town but were more inspired to register by a sense of civic duty than devotion to any particular candidate. “I haven’t paid attention,” said Eshleman, who said she leans Republican but didn’t yet know who she would support for Congress. Students aren’t just organizing in Whitman County to sway their colleagues. Gonzaga University’s two student clubs are working within the confines of their school’s policies in an effort to get younger voters interested in the Congressional race. In a move that might seem strange, the Republicans and Democrats have agreed to appear next to each other at an event this fall to make their pitches to those students who are registered to vote in Spokane. Representatives of both clubs said the arrangement was made to satisfy the university’s concerns about appearing partial to either candidate. While the Young Democrats have made some voter registration efforts, they’ve done so off the campus grounds, Willins said, and merely pointed students in the right direction, rather than directly registering them. The college’s Republican group is instead focusing its efforts on encouraging voters in other parts of the community to cast their vote for McMorris Rodgers, said Megan Lavagnino, a senior studying special education who serves as secretary for the Gonzaga University College Republicans. A resident of Wenatchee, Lavagnino said many of her classmates are like her and remain registered to vote in their hometowns. That philosophy shows a marked contrast to the Democrats, who make the hard sell to West Side students that their vote will matter more if it’s cast in Spokane, Willins said. The historical data is less compelling than at WSU that a push for Brown at either Gonzaga or Eastern Washington universities would be enough to add to Brown’s vote total in the district overall. Historically, voter turnout hasn’t shown a significant increase in the Logan Neighborhood surrounding Gonzaga between the primary, when students are out of town, and the general election when students are on-campus for the fall semester. In the 2016 campaign, the precincts surrounding Gonzaga showed an increase of between 350 and 400 votes, while areas of the South Hill – strong areas for Hillary Clinton and Pakootas – showed more significant bumps in turnout, inching closer to 600 more voters in the general. That’s also where Pakootas had his strongest showing in races against McMorris Rodgers. That pattern also held true in the 2014 elections, though the vote gains were lower due to lower turnout overall in an off election year. In Cheney, the Republican vote in the areas around town was enough in both the 2014 and 2016 general elections to give McMorris Rodgers an edge over Pakootas. In 2016, that included the part of town with the largest increase in turnout, indicating that any potential bump from students at Eastern Washington University voting for Democrats was offset by strong Republican turnout elsewhere in town. For Brabb, the focus on getting out the vote on campus will be less important to the November totals than the legacy of Republican voters in Whitman County that surround Pullman. “The rest of Whitman County, it hasn’t changed,” he said. But that’s not going to stop Berkompas, and other young Democrats, from trying. “I think WSU can be the difference in this election,” he said. Staff writer Jim Camden contributed analysis and reporting for this article.